So you are ready to head to the outdoors, but have no medical background to handle those injuries that might come your way. Or what to do about a sudden bee sting. Encountering poison ivy. Or knowing the signs of hypothermia before it is too late. Look no further than this handy guide that gives a fine outline of common maladies affecting hikers and what to do. The book is divided into sections dealing with the issues that can arise. It gives a short easy to understand description of the condition, the signs and symptoms, and how to treat. Topics covered include first aid supplies, resuscitation, hydration, exposure, skin wounds, reactions, bones and joints. 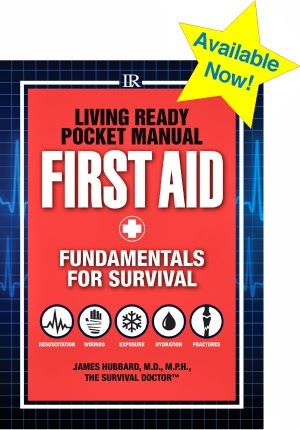 While not a substitute for actual training like taking a Wilderness First Aid course or in place of seeking medical attention, this manual is a valuable tool for a hiker to know what to do when the unexpected can and will happen. It should be required reading before any major hike. Dr. Hubbard is a long time family doctor of 35 years. In addition to his MD, he also has a Master’s in Public Health. On his website Dr. Hubbard shares how to treat medical problems when medical professionals are unavailable. He is also the author of The Survival Doctor’s Guide to Wounds and The Survival Doctor’s Guide to Burns. All books are available through his website. Upcoming 2019 Hiking Festival Schedule - Meet Hiking Friends! Novels - Yes, I'm an Author! 2011-2015 Lauralee Bliss. Simple theme. Theme images by gaffera. Powered by Blogger.